Demand for the Sarawak property market is expected to shoot up in the second quarter of 2009, following various measures taken by the government to kick-start the economy. State Housing Minister Datuk Abang Johari Tun Openg said in the first quarter of this year, the value of unsold completed properties amounted to RM260.76 million, involving 654 housing units, 300 shoplots and 10 industrial premises. "There are also properties under construction but still can't be sold. They are 1,411 houses and 118 shoplots," he said when opening an online briefing on "Property Information System Malaysia (Pris-ma)", in Kuching yesterday. Prisma is a National Property Information Centre (Napic) run by finance ministry agency Property Services and Evaluation Department. The sytem enables Napic to collect and make available property information online, helping policymakers and related industries to make decisions on the direction of the national property industry. Costing abour RM23 million, Napic will use Prisma from next year. Meanwhile, to avoid supply exceeds demand, Abang Johari has asked Sarawak investors to get latest and accurate information on properties. "I find the supply surplus is in the commercial ad industrial building units. This can be overcome if the relevant authorities contact Napic to obtain accurate data and information," he said. Later at a press conference, Abang Johari said the state goverment has no plans to introduce a ceiling price for various types of residential houses, except for low-cost houses in Sarawak, to avoid "mismatch" of supply and demand in the housing industry. "Let the open market dictate house prices in Sarawak as fixing them can backfire," he said, adding that house prices would fluctuate based on oil and construction material prices. Stressing that the ceiling price for low-cost houses would be maintained to ensure that low-income earners would be able to own houses, he said "it's much better for the buyers and developers to negotiate the ideal price for the house". NUSAJAYA: UEM Land Holdings Bhd and Malaysian Biotechnology Corp Bhd (BiotechCorp) will next month sign an agreement to form a special purpose vehicle (SPV) to undertake the development of a biotech park project. Known as BioXCell, the project will occupy a 32.37ha site in the Southern Industrial and Logistics Clusters (SiLC) near here. The 526.10ha SiLC in Nusajaya is being developed by UEM Land as a clean and green, managed industrial park, and has to date attracted RM115mil investments, of which 50% are from foreign companies. “We are currently in advanced talks to determine the equity for each party in the SPV,” UEM Land strategic marketing and corporate communications director Zulkifli Tahmali told StarBiz. He said the SPV would have its own board of directors, source its own funding for the project and attract investors to the biotech park. Zulkifli said UEM Land, as master developer of the 9,600ha Nusajaya, would only focus on its developmental expertise and the management of the project and facilities. He said it would provide the land and infrastructure for the biotech project while BiotechCorp would bring in the biotech expertise, marketing, regulating and offer incentives to local and foreign biotech companies. “I personally consider the collaboration a perfect marriage between the two parties,” he said. He said BioXCell was in a unique position as no other biotech park project in the country was developed on a joint-venture basis between a property developer and the lead agency responsible for developing the biotech industry in Malaysia. On why the biotech component was now included in the development plan of SiLC, Zulkifli said the company was just being pragmatic in its business undertakings. “Our biotech park will benefit from its close proximity to Singapore because of the latter’s advanced biotech industry while Universiti Teknologi Malaysia, which is strong in life sciences, offers a ready pool of human capital,” he added. Zulkifli said the Nusajaya biotech park would play a complementary role to the advanced research and development (R&D) parks in Singapore, namely Biopolis and Tuas Biomedical Park. He said the company also wanted to bank on the SiLC’s excellent connectivity to the Port of Tanjung Pelepas, Johor Port, Senai Airport, North-South Expressway and Singapore’s Port of Singapore, Jurong Port and Changi Airport. He said ideally, a biotech park should have three main clusters – advanced R&D (drugs discovery), clinical research organisations (CROs) to provide clinical services to the R&D, and contract manufacturers to produce the drug formulations. “However, not all of them can be in Singapore due to the cost factor and with the tightening of the economy, Johor is the best choice for biotech companies,” said Zulkifli. He said BioXCell would be the best choice for players involved in biotech-related activities due to its strategic location, competitive cost and close proximity to Singapore with excellent seaport and airport connectivity. 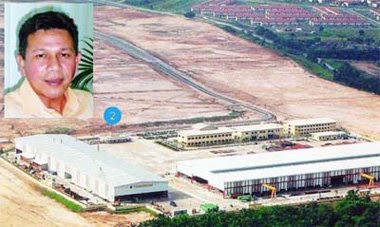 Zulkifli said UEM Land had completed a request for information from a European drug manufacturer planning to set up a plant here and one question was the number of direct weekly flights to London from an airport within an hour’s drive from Johor. He said it had received queries from established biotech companies from Asia and the United States wanting to consolidate their operations and CROs to set up shop in Johor after learning of the biotech park project. Zulkifli said Malaysia would be a good choice for the CROs because its three main races – Malays, Chinese and Indians – presented an opportunity for immediate clinical trials for the CROs. He said the clinical trial results could be applied on several million other Malays in the region, and the one billion Indians and 1.3 billion Chinese in the world. “Malaysia is also rich in biodiversity, especially our plant species in the centuries-old jungles, that can be developed into pharmaceutical products through R&D initiatives and activities,” said Zulkifli. UEM Land Holdings Bhd is exploring various funding options including issuance of convertible bonds, to raise funds for its ongoing development activities in Nusajaya, Johor. “However, no decision has been made by the board of directors on any of these funding options,” it told Bursa Malaysia in response to reports that it plans to issue some RM550 million in convertible bonds. PETALING JAYA: Axis Real Estate Investment Trust (Axis REIT), which reported an improved second-quarter results yesterday, has proposed to acquire a property Axis Steel Centre in Klang, Selangor, for RM65mil cash. Axis REIT’s fund management firm, Axis REIT Managers Bhd, also planned to increase the fund’s size to pay for the acquisition, it told Bursa Malaysia yesterday. Axis Steel Centre is an industrial complex with total built-up area of 366,839 sq m, located on a 66,450-sq-m piece of land. Axis REIT had proposed to acquire the property from certain directors related to the fund and Baiduri Kemas Sdn Bhd, which is a major unitholder of Axis REIT. Axis REIT said the terms of the proposed acquisition had been reviewed by its audit committee, which is satisfied that the deal was at “arm’s length” and “will not be detrimental to the interest” of Axis REIT unitholders. The managers proposed to issue new units for the acquisition by the fourth quarter of this year. In a separate statement, Axis REIT said it would pay unitholders a dividend of 4.1 sen per unit less tax for the second quarter ended June 30, compared with 3.76 sen per unit less tax paid a year ago. The dividend ex-date was set at 5pm July 31. The property investment trust reported a net profit of RM12.54mil, or 4.9 sen per unit, during the quarter under review against a net profit of RM9.59mil, or 3.75 sen per unit, in the previous corresponding period. Axis REIT Managers said it was optimistic of maintaining its current performance for the rest of the financial year. In a separate statement, the fund said its net asset value had increased from RM1.75 per unit (as at June 30) to RM1.76 per unit upon incorporation of a revaluation surplus of RM1.96mil. This was after the revaluation of two properties owned by the trust. AXIS REIT Managers Bhd, the manager of Axis Real Estate Investment Trust (REIT), has partially agreed to buy an industrial complex in Klang, Selangor, from Maximum Icon Sdn Bhd (MISB) for RM65 million. Dubbed The Axis Steel Centre, the complex is expected to offer Axis REIT with a stable income distribution and growth in net asset value per unit. The centre is currently being leased by Konsortium Logistik Bhd. “The proposed acquisition will at the same time diversify and enlarge Axis-REIT’s portfolio of properties and is expected to benefit the fund in the long term from economies of scale,” it told Bursa Malaysia yesterday.